Holy Nobleborn Prince Andrew (Andrei) Bogoliubsky (1110-1174), a grandson of Vladimir Monomakh, was the son of Yurii Dolgoruky and a Polovetsian princess (in holy Baptism Maria). While still in his youth he was called "Bogoliubsky" ("God-loving") for the constantly inherent to him profound attention to prayer, his diligence for church services and "his adoption of secret prayers to God". From his grandfather, Vladimir Monomakh, the grandson inherited great spiritual concentration, love for the Word of God and the habit of turning to the Scripture in all the circumstances of life. A brave warrior (Andrew – means "brave"), a participant of the many campaigns of his military father, more than once in the fray of battle he was close to death. But each time Divine Providence invisibly saved the princely man of prayer. Thus for example, on 8 February 1150, in a battle near Lutsk Saint Andrew was saved from the spear of an enemy German by a prayer to the GreatMartyr Theodore Stratilates, whose memory was celebrated that day. The chronicles stress together with this the peace-making activity of Saint Andrew, rare amongst the princes and military commanders of these harsh times. The combination of military valour with love for peace and mercy, of great humility with indomitable zeal for the Church were in the highest degree innate to Prince Andrew. A responsible master of the land, and a constant co-worker in the city construction and church building activity of Yurii Dolgoruky, he built with his father: Moscow (1147), Iur'ev-Pol'sk (1152), Dmitrov (1154), and he adorned with churches the cities of Rostov, Suzdal', and Vladimir. In 1162 Saint Andrew could say with satisfaction: "I have built up white Rus' with cities and settlements, and have rendered it with much populace". When Yurii Dolgoruky became greatprince of Kiev in 1154, he gave his son as appanage portion Vyshgorod nearby Kiev. But God destined otherwise. One time by night in the Summer of 1155, the wonderworking Icon of the Mother of God in the Vyshgorod church was removed. This icon was written by the holy Evangelist Luke, and in some period before this had come transferred hither from Tsar'grad (Constantinople), and afterwards it was given the name – the Vladimir Mother of God. On this night with the icon in hand, holy Prince Andrew left Vyshgorod going northwards to the Suzdal' land, secretly and without the blessing of his father, heedful only to the will of God. The miracle from this holy icon, occurring on the way from Vyshgorod to Vladimir was recorded by a clergyman of Prince Andrew, "the priest Mikula" (Nikolai), in his "Reports of Miracles of the Vladimir Icon of the Mother of God". Ten versts before reaching Vladimir, the horse, bearing the icon bound for Rostov, suddenly stopped. And during the night the Mother of God appeared to Saint Andrew with scroll in hand and commanded: "I want not that thou shouldst bear My image to Rostov, but rather establish it in Vladimir, and upon this place erect thou a stone church in the name of My Nativity". In memory of this miraculous event, Saint Andrew commissioned an iconographer to write an icon of the Mother of God suchlike as the All‑Pure Virgin had appeared to him, and he established feastday for this icon as 18 June. 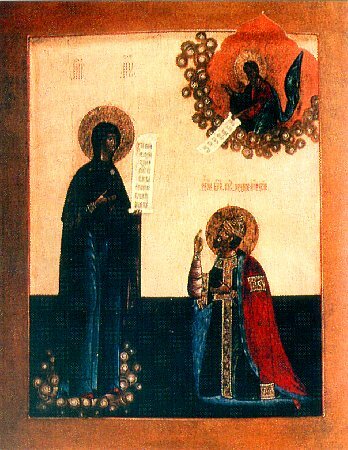 The icon, named the Bogoliubsk, was afterwards glorified by numerous miracles. Upon the place decreed by the Queen of Heaven, Prince Andrew built (in 1159) the church of the Nativity of the Mother of God. He situated here also the city of Bogoliubov, which became his constant dwelling and the place of his martyr's end. When his father Yurii Dolgoruky died (+ 15 May 1157), Saint Andrew did not take up his father's throne at Kiev, but rather remained prince at Vladimir. During the years 1158-1160 was built the Uspenie (Dormition) cathedral at Vladimir, and into it was placed the Vladimir Icon of the Mother of God. In the year 1164 there were erected the Golden Gates, with the over-gate church of the Placing of the Robe of the Mother of God, and also the church of the Saviour at the princely court. Thirty churches were built by Prince Andrew during the years of his rule. The finest of them – is the Uspenie cathedral. The richness and splendour of the church served in spreading Orthodoxy amongst the surrounding peoples and foreign merchants. All the travellers, whether Latins or pagans, – Saint Andrew had directed, – were to be led into the churches built by him and to have pointed out to them "true Christianity". The chronicler writes: "Both Bulgars, and Jews, and every sort of common person, beholding the glory of God and churchly adornment, came to be baptised". The conquest of the great Volga journey-way became for Saint Andrew a fundamental task of his civil service to Russia. The Volga Bulgars from the time of the campaigns of Svyatoslav (+ 972) presented a serious danger for the Russian state. Saint Andrew continued with the initiative of Svyatoslav. A shattering blow was struck against the enemy in 1164, when Russian forces burnt and destroyed several Bulgar fortresses. Saint Andrew took with him on this campaign the Vladimir Icon of the Mother of God and a two-sided icon, on which was imaged upon the one side the "Saviour Not-Wrought-by-Hand", and the "Veneration to the Cross" on the opposite side. (At the present time both icons are in the Tret'yakov State Gallery). A great miracle from the holy icons occurred for the Russian army on the day of the decisive victory over the Bulgars, 1 August 1164. After the destruction of the Bulgar army, the princes (Andrew, his brother Yaroslav, his son Izyaslav and others) returned towards the "footmen" (infantry) standing by the princely standards with the Vladimir Icon, and they made prostration to the Icon, "bestowing it praise and song". And then all beheld the blinding rays of light, issuing from the face of the Mother of God and the Saviour Not-Wrought-by-Hand. Remaining in everything a faithful son of the Orthodox Church, vigilant in belief and canons, Saint Andrew turned to the Patriarch of Tsar'grad with a filial request to establish a separate metropolitan for north-eastern Rus'. And with the prince's letter of accord there journeyed to Byzantium the candidate chosen by the prince, – the Suzdal' archimandrite Theodore (Feodor). Patriarch Luke Chrysobergos however consented to consecrate Theodore only as bishop of Vladimir, but not as metropolitan. Yet at the same time, wanting to uphold the position of Prince Andrew as the most powerful amongst the rulers of the Russian Land, the patriarch dignified bishop Theodore with the right to wear the "white klobuk" (hierarch's headgarb), which in ancient Rus' was a distinctive sign of churchly autonomy – a recognition of esteem likewise granted the archbishop of Novgorod by his white klobuk. Evidently, since the Russian chronicles bespeak bishop Theodore with the title of "White Klobuk", much later historians sometimes call him "an autocephalous bishop". In the year 1167 Saint Rostislav died at Kiev. He was the twin brother of Andrew, and had been able to carry out compromise amongst the complicated political and churchly life of the time. But after this, there was dispatched from Tsar'grad a new metropolitan, Constantine II. The new metropolitan demanded that bishop Theodore come before him for confirmation of position. Saint Andrew again recoursed to Tsar'grad for affirmation of the autonomous status of the Vladimir diocese and again he requested a separate metropolitanate. The letter of reply from patriarch Luke Chrysobergos has been preserved: it contains a categorical refusal for establishing a new metropolitan, a demand to accept the expelled bishop Leon, and to submit to the Kiev metropolitan. In fulfilling the duty of this churchly obedience, Saint Andrew urged bishop Theodore to journey in repentance to Kiev for the restoration of canonical relations with the metropolitan. The repentance of bishop Theodore was not accepted. Without investigation by a council, and in accord with the Byzantine morals of the time, metropolitan Constantine condemned him to a terrible execution: they cut out the tongue from Theodore, they cut off his right hand and then they gouged out his eyes. After this he was drowned by servants of the metropolitan (by other accounts, he died in prison). Not only the churchly, but also the political affairs of Southern Rus' demanded the decisive response of the Vladimir Great-prince. On 8 March 1169 an army of allied princes with Andrew's son Mstislav at the head conquered Kiev. The city was devastated and burned, and the Polovetsians participating in the campaign did not spare even the churchly treasures. The Russian chronicles viewed this event as a merited requital: "These misfortunes were for their sins (the Kievans), especially for the outrage perpetuated by the metropolitan". In the same year 1169 the prince moved an army against unruly Novgorod, but they were repulsed by a miracle from the Novgorod Icon of the Mother of God of the Sign (Comm. 27 November), which had been carried along the city walls by holy Archbishop John (+ 1186, Comm. 7 September). But when the understandable wrath of the greatprince gave way to mercy, and in peace he summoned the Novgorod people to him, the blessing of God returned to him: Novgorod accepted the prince appointed by Saint Andrew. In such a manner, towards the end of 1170 Saint Andrew Bogoliubsky was able to attain the unity of the Russian Land under his rule. In the Winter of 1172 he dispatched against the Volga Bulgars a large army under the command of his son Mstislav. The Russian forces gained the victory, but their joy was overshadowed by the death of the valiant Mstislav (+ 28 March 1172). ...On the night of 30 June 1174 holy Prince Andrew Bogoliubsky accepted a martyr's death at the hands of traitors in his own household. The "Tver Chronicle" relates, that Saint Andrew was murdered at the instigation of his second wife (a Volga Bulgar), who participated in the conspiracy. At the head of the conspiracy stood her brothers, the Kuchkovichi: "and they did commit murder in the night, as did Judas against the Lord". A throng of assassins, twenty men, burst in upon the court, they killed the few guards and stormed into the bedchamber of the unarmed prince. The sword of Saint Boris, which hung constantly over his bed, had been treacherously removed that night by the steward Anbal. The prince succeeded in shoving down upon the floor the first of his assailants, whom the conspirators then mistakenly ran through with their swords. But soon they realised their mistake: "and then they did perceive the prince, and he fought much with them, for he was strong, and they did thrust with swords and sabres, and copious wounds did give him". The forehead of the holy prince was struck on the side with a spear, while all the remaining blows from the cowardly assassins were dealt from behind. When the prince finally fell, they abruptly rushed out of the bedchamber, taking along their murdered accomplice. But the saint was still alive. With his final strength he lowered himself along the palace stairway, hoping to alert a guard. But his groans were heard by the assassins, and they turned back. The prince was able to hide himself in a niche below the stairway and so be bypassed by them. The conspirators rushed to the bedchamber but did not find the prince there. "Disaster stands afront us, since the prince is alive", – in terror cried out the assassins. But all around it was quiet, and no one came to the aid of the suffering prince. Then the evil-doers again regained their boldness, they lit candles and followed along the bloody trail to seek out their victim. Prayer was on the lips of Saint Andrew when the assassins again surrounded him. The Russian Church remembers and venerates its martyrs and makers. A special place belongs to Saint Andrew Bogoliubsky within it. Having taken in his hands the wonderworking image of the Vladimir Mother of God, the holy prince as it were blessed with it both then and through the centuries the major events of Russian history. In 1395 was the year – of the transfer of the Vladimir Icon to Moscow and the deliverance of the capital from the invasion of Tamerlane (Comm. 26 August); the year 1480 – was the salvation of Rus' from the invasion of khan Akhmat and the ultimate collapse of the Mongol Horde (Comm. 23 June); the year 1521 – was the salvation of Moscow from the invasion of the Crimean khan Makhmet-Girei (Comm. 21 May). Through the prayers of Saint Andrew, his fondest dreams for the Russian Church came true. In the year 1300 metropolitan Maksim transferred the All-Russian Metropolitan seat from Kiev to Vladimir, making the Uspensky sobor (Dormition cathedral), – wherein rest the relics of Saint Andrew, the foremost cathedral of the Russian Church, and the Vladimir wonderworking Icon – its chief holy thing therein. Later on, when the All-Russian churchly centre shifted to Moscow, selections of the metropolitans and patriarchs of the Russian Church were made before the Vladimir Icon. In the year 1448 in front of it, a Council of Russian bishops raised up the first Russian autocephalous metropolitan – Sainted Jona. On 5 November 1917, in front of it was made the selection of His Holiness Patriarch Saint Tikhon – the first such after the restoral of the patriarchate in the Russian Church. And in 1971, on the feastday of the Vladimir Icon of the Mother of God, there took place the enthronation of His Holiness Patriarch Pimen. The liturgical activity of Saint Andrew was multi-faceted and fruitful. In 1162 the Lord granted the holy prince a great solace: in Rostov there was discovered the relics of Rostov saints – the Sainted-hierarchs Isaiah and Leontii. The glorification throughout all the Church of these Rostov saints took place somewhat later, but Saint Andrew initiated the beginning of their national veneration. In 1164 the military forces of Saint Andrew crushed their long-time enemy, the Volga Bulgars. The victories of the Orthodox nation were marked by a blossoming of liturgical creativity within the Russian Church. In this same year of 1164, at the initiative of Saint Andrew, the Church established the feastday to the All-Merciful Saviour and the MostHoly Mother of God on 1 August (venerated by the Russian people as "Saviour of First-Honey"), – in memory of the Baptism of Rus' by holy Equal-to-the-Apostles Vladimir and in memory of the victory over the Bulgars in 1164.The soon thereafter instituted feastday of the Protection (Pokrov) of the Mother of God under 1 October embodied in liturgical forms the faith of the holy prince and all the Orthodox nation – in the acceptance by the Mother of God of Holy Rus' beneathe Her omophorion. The "Pokrov" of the Mother of God became one of the most beloved of Russian Church feastdays. The Protection – is a Russian national feastday, unknown to both the Latin West, and the Greek East. It is a liturgical continuation and creative developement of theological ideas, inherent to the feast of the Placing of the Robe of the Mother of God, on 2 July. The first church, consecrated to the new feastday, was the Protection at Nerla (1165), a remarkable monument of Russian Church architecture, built by the master artisans of Saint Andrew at the head-waters of the River Nerla, such that the prince could always see it from a window of his Bogoliubov garret. Saint Andrew took an active part in the literary work of the Vladimir church writers. He participated in the compiling of the Service of Pokrov (the most ancient copy is on the parchment of a XIV Century Psalter), and also a preface account about the establishing of the feastday of the Protection (Great Chet' Minei [Great Reading Meneion] under month October), as well as a "Discourse on the Protection". He wrote an "Account about the Victory over the Bulgars and the Establishing of the Feast of the Saviour in the Year 1164", – which in several of the old manuscripts is entitled thus: "Discourse concerning the Mercy of God by GreatPrince Andrei Bogoliubsky". The fate of Bogoliubsky is also noted in the Vladimir Chronicle entry for the year 1177, completed after the death of the prince by his confessor, the priest Mikula, who inserted therein his special "Account about the Murder of Saint Andrew". To Saint Andrew's time belongs also the final redaction of the "Account about Boris and Gleb", inserted into the "Uspensk Sbornik" ("Compendium" or "Collected-service Book"). The prince venerated particularly Saint Boris, and his chief household sacred-treasure was a cap of Saint Boris. The sword of Saint Boris hung always over his bed. A memorial likewise of prayerful inspiration of Saint Andrew is "A Prayer", included in the chronicle under the year 1096 after the "Instructions of Vladimir Monomakh".